I think all of the above fonts were free with the exception of LD Traditional Print. 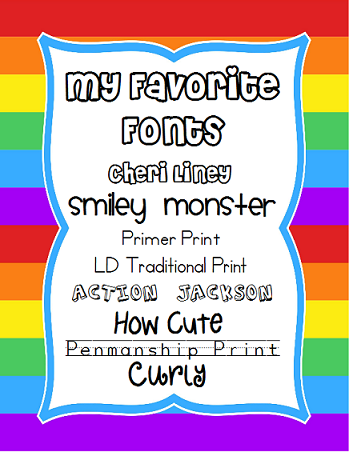 I’ve had most of these fonts for so long I don’t remember the exact place I got them, but if you do a Google search I am sure you can find them all! I use Primer Print, Penmanship Print, and LD Traditional Print a lot when making worksheets, especially Penmanship Print. It’s the easiest at making dotted lines for worksheets. Share your favorite links by visiting Finally in First! Love these! Thanks for coming to my linky party!